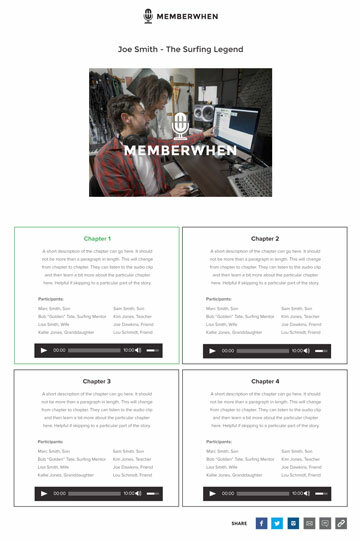 MemberWhen produces customized podcasts for audio storytelling. We help people who want to listen to their stories in the voices that matter to them. Think of it as your own personal podcast. How does MemberWhen work exactly? MemberWhen uses short recorded telephone conversations to capture the voices important to you. Don't worry, our storyographers ask easy questions to guide the discussions. All you need to do is talk and share. Our creative team does the rest; editing and sequencing, adding music and narration, until you have a product --your MemberWhen -- that you will love forever. What do I get for my MemberWhen? Each MemberWhen is professionally produced into a private audio file about 20 minutes long, and delivered to you in a personalized webpage you can enjoy and share. Your page even includes links to popular social media to make sharing your MemberWhen a breeze. Can I hear a sample MemberWhen? Yes (and we are so glad you asked)! Click here to listen to short samples of MemberWhens. Click here for a longer sample. Do I need to prepare for my conversation? Nope! There are no trick questions. You are talking about your life, no one knows it better than you do. What if I’m buying MemberWhen as a gift? Whether it’s for a birthday, anniversary, wedding or some other event, we will work with you to create the best gift they’ve ever heard (and if it’s a surprise, we can even keep it secret). Just give us three weeks to prepare the best gift they've ever heard. And if you need it sooner, call us, we have options. Once you sign up by ﬁlling out this form we will contact you to get your MemberWhen started and schedule the ﬁrst conversation/s. If you’d like to talk, use the chat feature on this page. Where can I find testimonials? Listen to their stories here. Imagine what yours could be. Have a question we didn't answer? We’re happy to chat! Use the chat feature on this page or click to Contact Us. Thanks for your interest in MemberWhen! © 2016 MemberWhen - All rights reserved.